Pendleton County Courthouse - Falmouth, Ky.
Pendleton County and Falmouth were one of those counties and courthouses that were a huge hole in my map for a long time. Pendleton County sits right there along I-75, but is so far off the road that it takes a special trip to get there. This beautiful little courthouse sits perfectly within downtown Falmouth, and is only the second courthouse in Pendleton County. 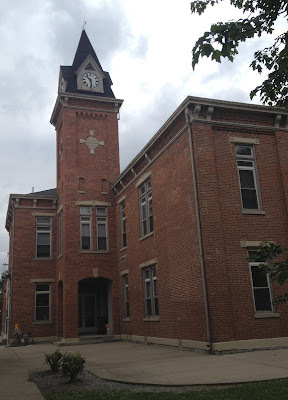 According to John W. Carpenter's Kentucky Courthouses, this courthouse was built in 1848. Apparently, the original structure sits to the right in the picture above. Pilasters on the front of that square building indicate construction in the Greek Revival style. But a huge remodeling took place in 1884. An addition (shown to the left of the photo) and a clock tower were built with the clock tower connecting the original structure with the addition. The remodeling brought the building up to "Victorian standards" and added trim, carved lentels over the windows, and other Victorian elements. A further expansion occurred in the 1970s, when a new addition was added and paint was sandblasted off the old brick. Falmouth has an interesting history. Located at the convergence of Licking River and South Fork, it is at the site of an early Native American settlement. Floods have devastated the community on a number of occasions, including 1937, 1948, 1964 (when more than 75% of homes in the city were flooded), and 1997 (when the river reached 52 feet and 80% of the town was submerged under several feet of water).